There are so many things to take into account when you decide on the style of your home. What does it make it your own, how can you put in otherwise dull items the real you? If you manage to find your style and come up with a natural flow when arranging the furniture and the accessories around the house, it means you’ve made it. You’re only missing one thing: the right curtains. A room won’t be complete without the right set of curtains, no matter how you go about it. A living room will lack in character, and your bedroom, well, won’t put you into the atmosphere you had in mind. To see what’s hot on the curtain market right now, check our selections out: the top noise reducing curtains, and the best insulating curtains of 2015. When you’re done taking a peek at those, take a deep breath and picture your bedroom curtains in your mind. Do you want the sheer ones which let light through? They come in tons of colors and shades, going from white, cream (very easy to use for various spaces) to bold colors (adding some drama to your bedroom’s looks). If luxury is written all over your house, your bedroom curtains should be in the same tone. Shop for the dramatic curtains with conspicuous and ornate hardware. I’m talking about velvet, tassel, sequin curtains which never miss to make an impression. Your children should be comfy and playful in their bedrooms also! So, when it comes to bedroom curtains for children, don’t hesitate to buy ones in bright colors, cartoon and animal prints, polka dots, or whatever other prints your little ones enjoy most! You should know by now if you’re the type that wakes up at the first rays of light, or that can sleep regardless of how lighted up the bedroom gets. Considering this, decide whether you’d rather have blackout curtains, blocking all light into your bedroom, or you’d rather have more transparent ones. Check out our guide for selecting blackout curtains. Even though you are a family and things tend to connect you, this doesn’t mean you like the same things – not in the same amounts, anyway. 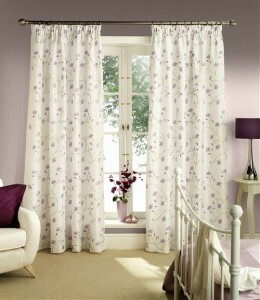 Bedrooms should differ and express the different personalities, therefore choose different curtains for every bedroom. After all, it’s so much fun to buy various things, and get creative in every bedroom! Keep in mind whether the bedroom that you’re buying curtains for takes in a lot of sunlight or not. A bedroom exposed to a lot of sunlight should have curtains made of fade resistant materials. It’s also important to think about the consistency of materials around your bedroom. They matter when you’re choosing the material of your curtains, as you want a natural flow of textures in your bedroom. Do you want to go for a romantic look in your bedroom? Hang white lace curtains in your bedroom. Pearl accents, embroidery, sheer screens also create or contribute to the romantic feel. Hearts and flowers embroidered on your curtains create a vintage classic look, as it does the whipe cotton curtains with stitching details. See-through curtains let natural light in and give a paradise island feel to your bedroom. Never ever forget about the accessories on your bedroom curtains. Go for decorative curtain hardware and tie-backs, metallic cords or even tie-back hooks for a luxurious look in your bedroom. For more curtain tips, head on here: https://verycozyhome.com/curtains/. Next What Curtains Are Best For Insulation?